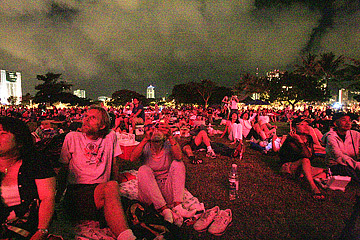 AS DARKNESS fell at Ala Moana Beach Park and thousands of residents got ready for the annual Fourth of July fireworks show, Coleman lanterns lit up the park grounds and hot dogs on the grills were replaced by marshmallows. Throughout the park last night, an occasional bottle rocket spun into the sky and every so often a firecracker went off. 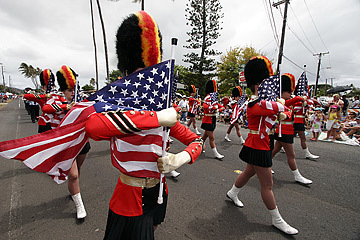 But for the most part, police and park goers said, it was a quiet Independence Day at Ala Moana, a difference of "night and day" from a year ago, when the celebration got out of hand -- with reported drunken brawls and burned victims from the countless fireworks that were lit that day. Because of those problems, police announced that as many as 130 officers would patrol the park yesterday to keep the festivities under control, crack down on illegal drinking and prevent the use of fireworks, which are illegal in parks. And they did, even with what seemed like minor fireworks violations. Among those who were warned but not cited were Eva Talvitie, who was visiting from Finland, and her 8-year-old grandson, Zack Mattero. Both were playing with sparklers in the sand. Zack was disappointed when officers told him to put the sparklers away. He lives in an apartment building and can't play with fireworks, and had come to the park to light them up. But Lori Carlos said she liked it much better this year without people lighting their own fireworks. People come to Ala Moana to watch the big fireworks show, not to play with fireworks, she said. Police Maj. Randy Macadangdang wanted to thank the public. "From what I am told, last year was basically like a war zone." So far, he said, things are going "fantastic." "The public responded to our plea to keep it safe," he said. 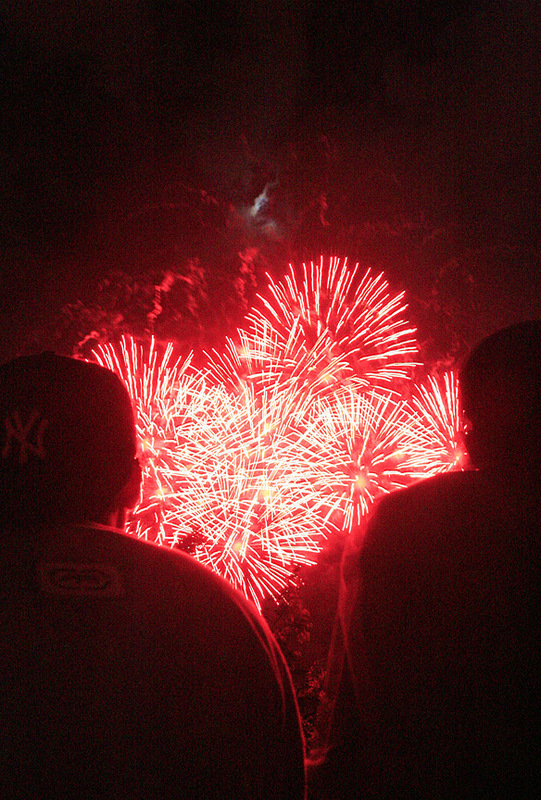 By 8 p.m., only five citations for fireworks had been issued, with no citations for alcohol. Macadangdang turned his attention to getting the public out of the park and Ala Moana Center as efficiently as possible to reduce traffic problems. The celebrations started long before dawn at Ala Moana, with many residents camping out to get the best spots. With the sun baking above him, charcoal smoking in the grill and the company of good friends enjoying a day off, Mike Lee was still hoping for one thing he had to leave at home during yesterday's Fourth of July celebration at Ala Moana Beach Park. "I would love to have one if they let us," Lee, 37, said while sipping soft drinks with his 8-year-old daughter and friends Troy Kepoo and Mike Bumonglag. "It's kind of junk, but it's OK."
But not everyone who flocked to Ala Moana to watch the fireworks show yesterday followed Lee's alcohol-free example. Many got around the ban by pouring beer inside plastic cups, instead of drinking directly from the bottle. Police issued a number of warnings, but limited citations to those who disturbed the peace or were blatant about drinking and fireworks use. 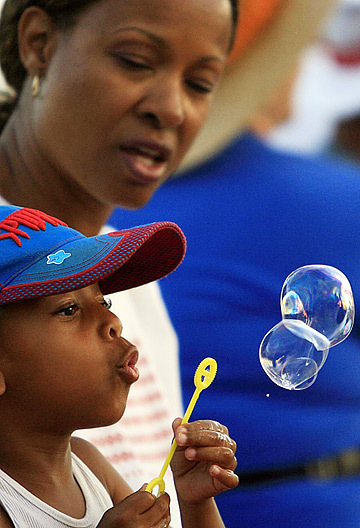 Most who packed the 119-acre park, setting up volleyball courts and picnic tables to commemorate Independence Day, said the warnings about the fines for drinking and using fireworks didn't ruin their parties. Parking filled up fast, and empty spots on prime grassy areas and on the sand near the surf were all but gone by noon. Some, like Funa Kapihe, didn't want to take any chances. The 34-year-old set up camp about 6:30 p.m. Monday to claim the same spot he has used to barbecue for the past six years with friends Casey Cooper and Rudy Domogsse, who was wearing a giant Uncle Sam hat. "We still have the pupus and the grill," Kapihe said when asked if the increased police presence at the park bothered the group. The police presence was obvious -- officers patrolled on all-terrain vehicles, bicycles and in patrol cars. Undercover teams in plain clothes also roamed the crowd, but enforcement was low-key. "We are outnumbered," said Sgt. Larry Santos of the Honolulu Police Department. "All we can do is just Band-Aid." The city, which has been shutting down Ala Moana park since March to make it safer and cleaner, left it open all night on July 3 to accommodate campers. Police said there were no disturbances overnight or in the morning. But about 2 p.m., the first incident of the day happened when someone set off an ear-snapping, 30-second firework display hanging from the tree where Eva Uran had found some shade to kick back and read a book. "I was screaming, I was so upset," said Uran, 57. "I had found a peaceful corner and was having a good time. It just shattered my peace." 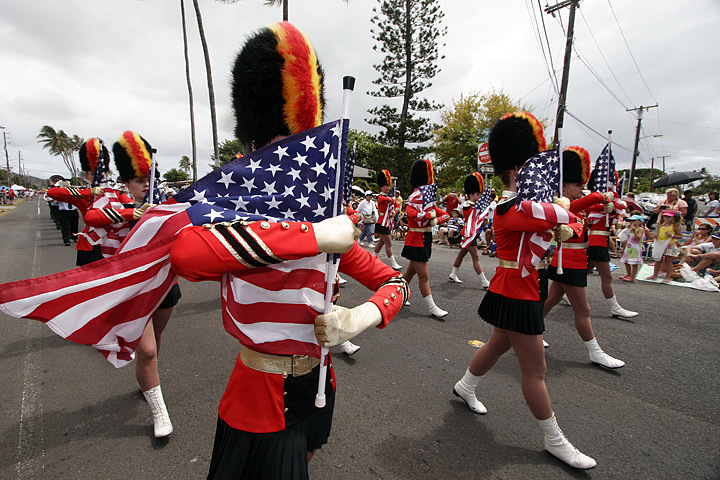 David Muelheim, who works at Tripler Army Medical Center, thought police did a good job of publicizing penalties, which range from jail time and up to $1,000 in fines for drinking and $2,000 for fireworks. While the announcement alone didn't stop most people from breaking the law, Muelheim said it at least forced people to be "more low-key about it." "If it was legal, it would be way worse," Muelheim, 41, said while getting a tan with wife Terrylisa, 40. "It's hard, but you got to be responsible."